I was pretty excited, as you can see. local chapter of Women in Transportation, which regularly offers tours of infrastructure projects in the area, in addition to hosting some great happy hours. The event began with a somewhat over-produced promotional video about how the bridge was going to be “one of the engineering marvels of the world,” as demonstrated with montages of construction work set to electric guitar riffs. Of course every major project wants you to know that it is something never-before-seen, challenging and amazing. But as the presentation progressed to a more technical video, I began to understand how unique the project really is. Once completed, the self-anchored suspension span of the bridge will be the largest of its kind in the world. That design was selected by the public as the “signature element” of the bridge, which is more aesthetically in keeping with other structures on the Bay and quite a bit less boxy and prison-like than the current bridge. Self-anchored suspension bridges have one continuous loop of cable anchored to the roadway, supported by (in this case) a single tower. Our tour guide likened it to an arm in a sling, where your arm is the deck of the bridge, and your shoulder is the tower. The cable was installed one strand at a time, and all 137 strands are anchored individually. The whole description of the project is riddled with superlatives. The tower is so massive that a crane had to be specially designed and fabricated to install it. The cable saddle is the world’s largest. Deck sections were moved into place with straddle carriers used by NASA to move shuttles. The whole affair will be one of the biggest public works projects in US history at $6.4 billion. Given the scope of the project, I was glad to have had it explained before we got on the boat. 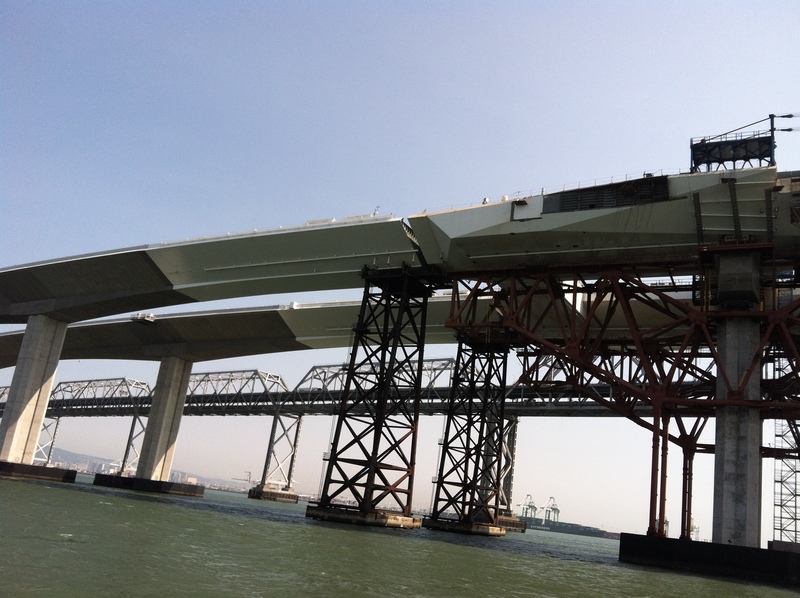 It was difficult to see the details of features like the hinge pipe beams that connect bridge sections and allow the sections to move relative to each other in the case of a major earthquake. The parallel decks of the Skyway section are on the left and the beginning of the self-anchored suspension span on the right. The existing Bay Bridge is in the background. Being so up close and personal with the bridge did allow me to see some other parts I never would have noticed. Like the “cormorant condos” — nesting platforms for the double-crested cormorants that seem to really enjoy living under the existing bridge. Since the cormorants were recently an endangered species, CalTrans is doing everything it can to encourage them onto the nesting platforms, building nesting houses and putting up decoy cormorants to try and lure the real ones to the new structure. We also got to squint at the Bay Bridge Troll, who is now destined for a museum. Overall, the event was a blast. I didn’t know very much about bridges going in, or this project in particular. Now at least I have a grasp on this bridge in particular. Bridge construction has had to avoid damaging this little former torpedo storehouse. Looking up at the tower for the SAS span. The tower has four legs, each of which are composed of four pieces welded and bolted together. Hinge pipe beam connecting the Skyway to the SAS span. Looking up at the bottom of the SAS deck, you can see the cormorant condos, complete with decoys. The lighting for the SAS span was designed by the same company that lights the Statue of Liberty. The lights face in the direction cars are going, so they light to roadway like headlights would, without glaring into drivers’ eyes. The suspender ropes connect the bridge span to the cable. At the time of the tour, they were in the process of being tightened. The parallel decks of the Skyway. It amazed me to see how the bridge decks could seem so complete, but still have, y’know, huge gaps. As interesting as all the temporary structures are — the falsework, the crew platforms — I’m excited to see the bridge’s final silhouette. The cable is composed of 137 strands, each made up of 127 wires. 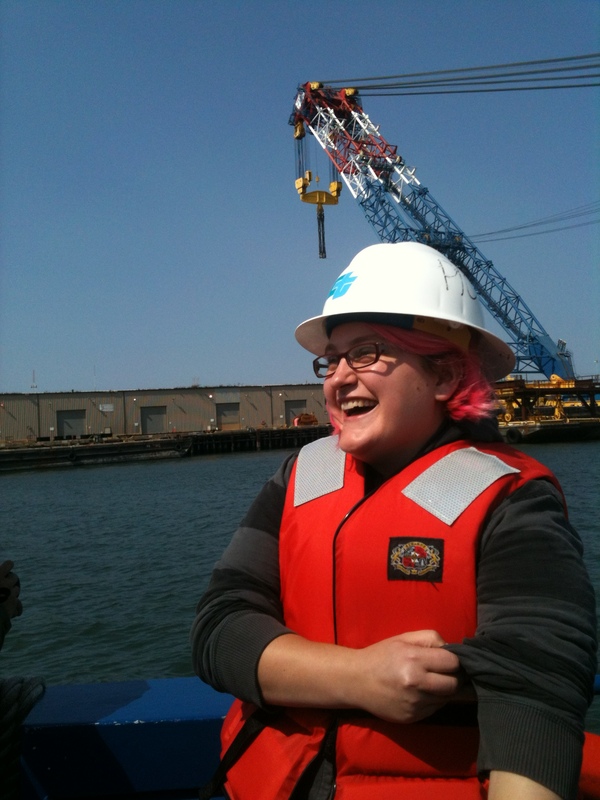 The boat ride also gave us a great view of the container cranes that are emblematic of Oakland’s port. Here you can see one of the cranes loading a barge.